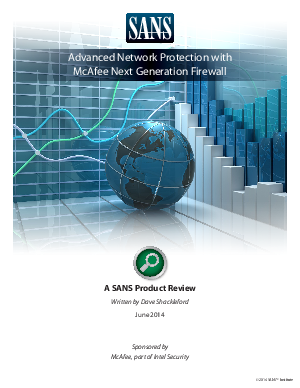 We had the opportunity to review McAfee Next Generation Firewall (McAfee NGFW) to see if it stands up to advanced threats and meets these requirements. We found McAfee NGFW’s interface easy to access and use and its policies simple to create and push to devices. The VPN capabilities worked as advertised, and the ability to create simple rules that automatically create VPN tunnels can help organizations protect data in transit. Its availability and redundancy features were easy to configure and functioned properly, and McAfee NGFW caught the advanced evasion techniques we threw at it, demonstrating a sophisticated application and protocol assembly and interpretation engine that will certainly help organizations defend against advanced attacks in their networks.